Taipei, Taiwan – FZtech is pleased to introduce the smart collection for Apple iPhone 5/5s - iSCOM series Smart Case: Smart Cover with Magnet, coded FZT-iS1. The hard shell case with smart cover is made of high quality ABS and rubber, offering the premium protection for Apple iPhone 5/5s. The magnetic cover can easily be fold into a stand for reading, typing and viewing. Moreover, it mounts iPhone 5 to the metal surface for ease of use. The iSCOM series features at convenient and smart, providing multi-function for Apple iPhone users. FZT-iS1 is a two-piece system comprising a magnetic cover and a metal plate inside case. The powerful force could easily mount the phone to any metal surface. This smart design allows users to attach iPhone directly to refrigerators for reading cookbooks, to whiteboards for time reminders or video calls, and there are many other creative purposes. 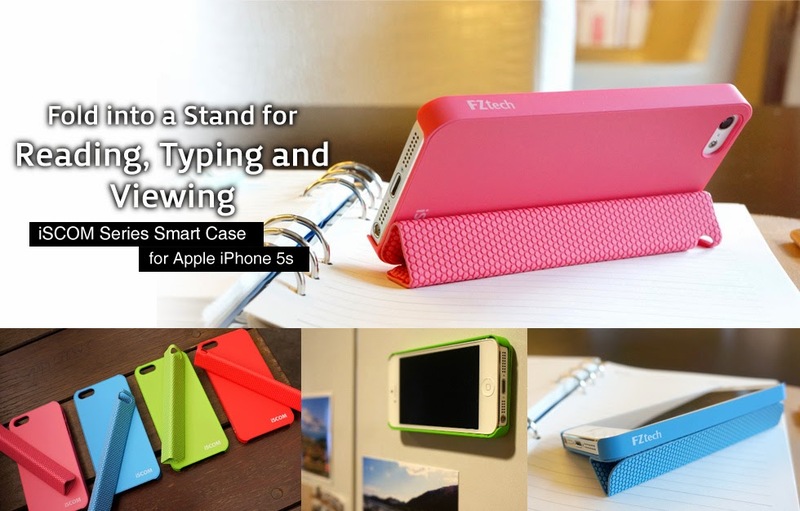 The magnetic smart cover can be fold up for use as a stand for reading, typing and viewing. Moreover, the roll up smart cover could be used as the holder for headphone and charging cable, making them organized and easy to carry. There are five color options, including black, red, blue, green and peach. It has perfect cutting for all ports, controls and cameras, offering comprehensive protection with open access. The series is available in Taiwan, Singapore and Thailand. FZtech welcomes global distributors, retailers, wholesalers and agents to bring the products worldwide. For more information please visit FZtech online.